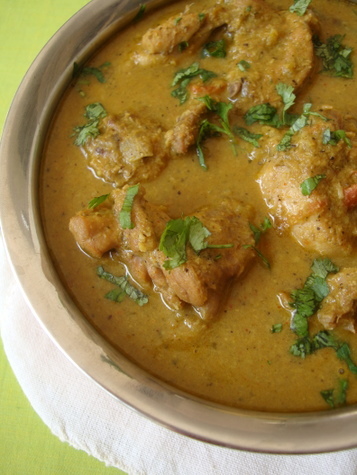 One of the best korma recipes I have prepared in recent times. Made for a wonderful side with Chicken Dum Biryani that I prepared on Sunday. The key to this recipe, which has its origins in the hill station of Tamil Nadu, is coconut, mint and coriander leaves which lends a greenish brown shade and infuses the korma with a mild sweet herby flavor, filling the kitchen with an aroma that is almost intoxicating. 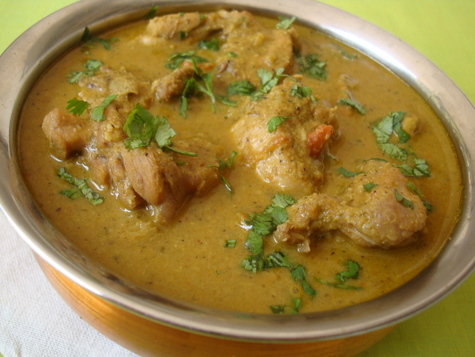 The use of aniseed (saunf) and cardamom add even more fragrance and flavor to the unassuming korma. I especially love the flavor and scent of mint leaves in this recipe. Its outright delicious! 1 Make a paste of ingredients under ‘dry roast’ and ‘roast’ by adding a few tbsps of water and keep aside. 2 Heat oil in a heavy bottomed vessel, add curry leaves and saute for few secs. Add the chopped onions and fry till transparent. Add ginger-garlic paste and saute for 3 mts. Add red chilli pwd, turmeric pwd and salt and combine. Add the chopped tomatoes and fry for 4-5 mts. 3 Add the ground paste and cook over medium heat for 7-8 mts. 4 Add lemon juice and the chicken pieces and combine. Cook without lid for 5-6 mts. Add 3 cups of water and cook with lid on simmer till the chicken is tender and the gravy thickens. Garnish with chopped coriander leaves. Turn off heat. 5 Serve with pulao, biryani, coconut rice or rotis. I have become a regular visitor to your site. I have been trying so many of your recipes for last several months and none of them failed me even once. I have been looking for a chicken biryani recipe (non-oven) as I feel oven makes it dry and I like that moisture in the biryani. I am now 8 month old pregnant and haven’t had any cravings yet. This is the first craving I ever had in my pregnancy after looking at your post :). I am going to try it this weekend. are you saying we should make a paste of these ingredients and then saute in a pan with a few tbsp of water. Or do we just grind and make a paste with a few tbsp of water. No heat applied. It is the words dry roast and roast that are creating the confusion. Do we heat in a pan or not? Please reply as I am eager to try this recipe. By the way, I am a 55 year old male in San Diego and every one of your recipes that I have tried out has won me a lot of praise from my wife. Thanks to you I am now passionately interested in cooking. God bless you and your family. You are doing a great service for all of us. Sorry for the confusion, Ram garu. First you need to take a pan and dry roast (without oil) the ingredients called for in ‘dry roast’ for 3-4 mts on low to medium flame. Remove the spices and keep aside. In the same pan add 2 tsps of oil and add the ingredients called for in ‘roast’ and roast for 4-5 mts on low to medium flame and remove from fire. Cool and grind all the ingredients under ‘roast’ and ‘dry roast’ by adding few tbsps of water. Hope its clear now. 2) Curry leaves are ground up in paste as part of the Dry Roast but called for again in step 2. 🙂 How many leaves to throw into oil in step 2? Roast means add some oil for the ingredients. After doing roast and Dry roast, you have to make it a paste with some water. She is making a paste not powder. Looks like an awesome recipe!.. but a quick question (rather, couple of questions 🙂 ) – do you think this recipe will taste good if veggies are used, instead of chicken? If yes, what veggies would you recommend? I have visited your site recently, and the way you are posting recipes is very good. Can you post recipe of Cake without using oven. Can we use regular onion (medium size) instead of shallots in the roast list? Shallots/sambar onions work best but you can use a medium sized onion. Hi Sailu… Planning to try this out on the weekend. Have tried out quite a few recipes from your blog. U r doing a gr8 job. I am going to try this over the weekend Sailu, but i am sure it will not taste as good as yours since i always mess up with chicken. But i have been getting better these days after trying some of your chicken recipes. Thanks Sailu and Priya for your explanations. Don’t Thank me Sailu gaaru, We are learning many recipes from you!! Thanks for this Website. That looks really delicious (what else can it be with all the roasted dry nutty things)! Bookmarked! can one use ground spices for the dry roast, or do you use whole spices and then grind them after you dry roast them? How do you grind your spices after you roast them? I tried the recipe today, it took me much long than you, nearly 2 1/2 hours – preparing and cooking. I think added too much lemon by mistake – otherwise it was fine. Using freshly ground spices is a key factor for this recipe, Jean. Having said that, you can use ground spices. Here in India we have a spice grinder which grinds few spices to a very fine powder. Tried out this Chicken recipe today. It turned out excellent! Made it with your Coriander & Mint rice. Both the recipes are simple & easy. Thank you so much for sharing. I tried it and it was awesome! Absolutely loved it! Chicken curry seems simply mouth watering…… Planning to prepare it this weekend with coconut rice as per your suggestion…….. Will give you an update next week…. Your website rocks!! I live in US & have enjoyed most of your recipes. We are hosting a birthday party for a 3 yr old. It would be great if you could suggest a good non veg menu for 30 ppl. Ugadi Subhakankshalu! I had prepared this Korma during this weekend. As usual, this receipe turned out yummy similar to all your other receipes. I have not been cooking a lot off late, just tried this recipe..mind blowing..everybody in the family loved it. Thanks for sharing. Im also from Vizag though now settled in Mumbai… and absolutely love reading up on all my childhood favorite dishes on ur blog. All the very best, and hope to look forward to many more recipes from you! I have been very conscious recently about the calorie counts. I had to watch my diet.huh. I know few of you are angry about this post. But recently India had been growing towards the big size, more Diabetes, more weight gain, more heart attacks. I noticed that we used ~5-6 tbsp of oil in this one dish :(. Thats like 500 cal from one ingredient, can we make it healthy ? Doctors had been spending time, govt on money, in educating the people about being diet conscious but this should begin here at the chefs place-kitchen. Sorry Sailu garu for the comment here. but its a place where ur talented skills shall be helpful for the healthy Indians. What is roasted chick peas? putnalu? Hi Sister, Great recipe that I just completed cooking. It tasted fabulous and truly kudos to your efforts in posting recipes for newbies like me across the world. Amazing how well the entire korma turned out to perfection, all thanks to ur measurements and ingredients. THANK YOU and may GOD Bless your Hands and prosper your family and you always. I tried this recipe and it came out very well. Thank you for sharing. just superb! 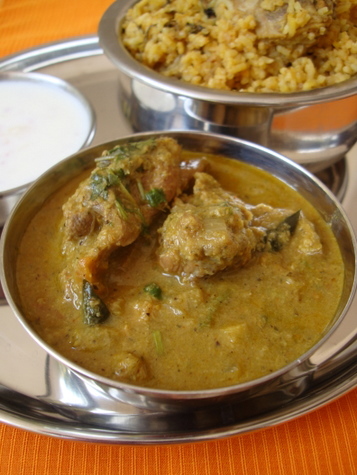 i had tried mutton nilgiri korma once and i had prepared green chutney of mint-corriander and the dish was greenish. but i feel your style and method is better than mine. thanks. hi sailu love your recipes. in this recipe under ingredients you have listed 15 mint leaves but your recipe does not state when to add them. Please go through the recipe carefully again. The curry leaves, onions, green chillis, mint and coriander leaves are to be lightly sauteed in oil and ground to a paste. I made this last sunday when my in laws came visiting. It turned out so delicious, my husband who never eats chicken prepared at home – he prefers a restaurant when it comes to chicken – loved it! At first when I was noting down the recipe he commented ” you are trying out a new recipe ? when my mom and dad are here ?” I assured him that this recipe is from Sailu’s blog, it WILL be good, and boy ! Was it ! I am going to make this again – and will try it with vegetables too. Been visiting your blog and tried many recipes with great success but this time I had to stop to leave a comment. Made this over the Thanksgiving break and it was a HUGE hit! Everyone in the family LOVED it! Thanks for a FANTABULOUS recipe! Your ingriedient lists mentions roasted chick peas- do you mean dalia?? May I ask.. when you say “cardamom”.. do you usually mean green or black cardamom? Thanks. a big thanks for this super yummy recipe :):) tried it last weekend and came out soo well ..have few guests for dinner tonight ..so thought of making it again :):)one of best chicken curry recipes !! I have just made this for lunch today and both my husband and daughter enjoyed the lunch. For dinner I served the gravy with batura and it was delicious. Thank you. Hi Shailu, am trying out your recipe for the 1st time. U hv mentioned ‘roasted chickpeas’. I hv seen raw ones and boiled and canned ones. Do u take the raw ones and just roast with the rest of the ingredients? Roasted chickpeas are already roasted and hence do not need to be cooked. It goes by the name dalia in Hindi and putnala pappu in Telugu. We are not talking about kabuli chana or garbanzo beans. Use the same recipe for about 3-4 cups of mixed vegetables. Can I replace roasted chickpeas with anything else as I dont use dalia at all. Also, can i make the veg recipe of the above, one day ahead. Use 6-7 cashew nuts. Yes, you can make a veg recipe and make it a day ahead. Use melon seeds also known as magaz in Hindi. i tried this, it came out nice. I would recommend it. Hi Shailu! Made this gravy this morning to have with Biryani that we were taking for an outing. So I made it in a hurry:) Inspite of that it turned out very tasty and was of the kind that I wanted to make. We’ll probably have more of it with rotis for dinner, and I’m sure it’s going to be even more delicious when had hot! Yes, it goes with rice too. Hi Sailu…I am a regular at your site. I have one important question. Dalia is hurikadle or putaani as they call here in Karnataka (the ones distributed at sankranti) while chickpeas are kabuli channa…so …for the roasted chickpea which ingredient do i need to us? Dalia or channa dal?? please answer. 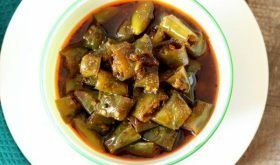 For this recipe you use dalia/putaani/putnala pappu. Hi Sailu thanks for your recipes! I’m from Australia and am not sure if we have the same size shallots as you. Ours are about one-half or one-third the size of an onion so 8-10 of them seems like a lot! What do you think? what are sambar onions?? if not availble here as i live in delhi can i substitue it with soemthing else? Sambar onions are also called pearl onions. They are very small in size. Tried it last night.. came out wonderfully.. added a little bit of chicken masala though to adjust to my pallette.. this is the first time trying out from your blog.. Thanks..